A Valentine’s Table for Two and a Party! Hooray, it is time for another tour of tables for a holiday! I hope you have had a chance to tour all of the beautifully styled tables for Valentine’s Day this week. If you haven’t taken the tour, now is the time! Twenty three talented ladies have each brought their own ideas ‘to the table’ so to speak. At the bottom of this post, click on the links and take the grand tour! Last week I shared a Valentine’s dinner table for four in Red & Gold. For my table this week, I am going quite different for Valentine’s day with black and white buffalo check. 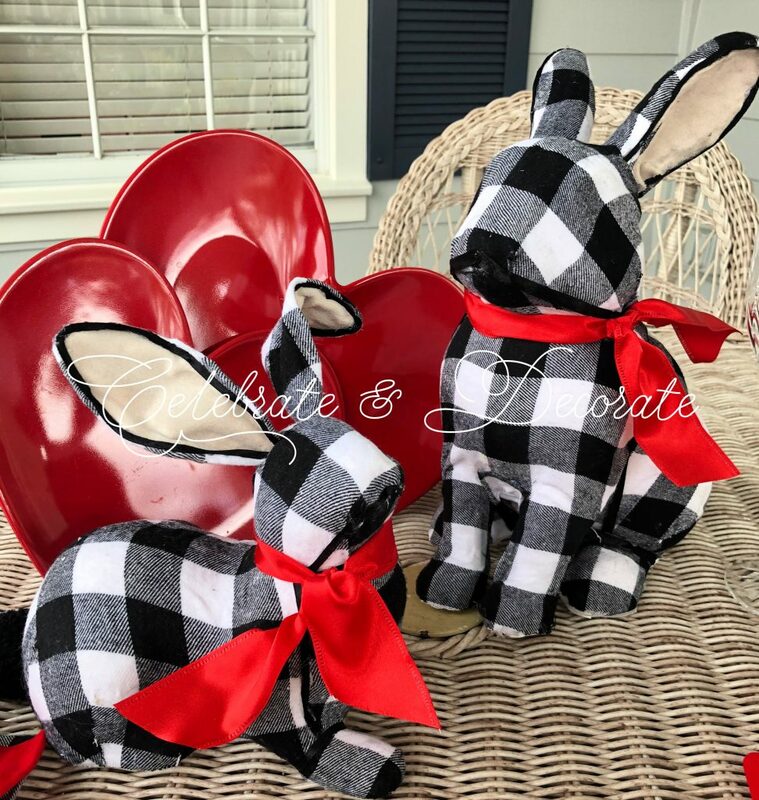 This pair of buffalo check bunnies caught my eye at Pier One Imports. I simply added red ribbons to them and they seemed perfect for my buffalo check Valentine’s table. 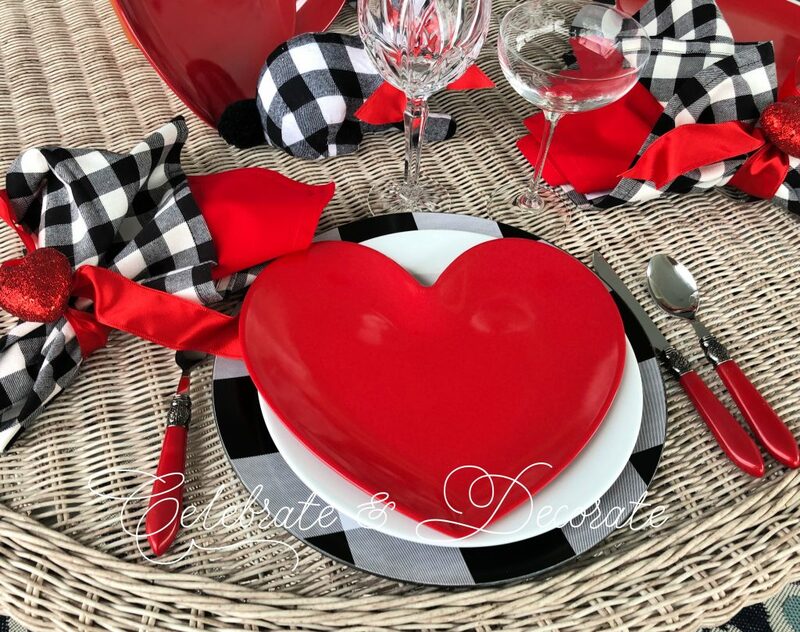 Black and white buffalo check napkins were layered over red napkins, I tied each of them with a red satin wired ribbon, and then glued a red glittery heart to the knot. Black and white buffalo check chargers were layered with white dinner plates topped with red heart dinner plates. Red flatware from The Pioneer Woman complements the settings. Stemware for this dinner is simple. We will indulge in Champagne, so I have set the table with crystal water goblets and Champagne coupes. Coupes are my new favorite way to treat myself to a glass of Champagne or a Champagne cocktail. A pair of red heart dishes frames my pair of bunnies perfectly for my Valentine’s table. 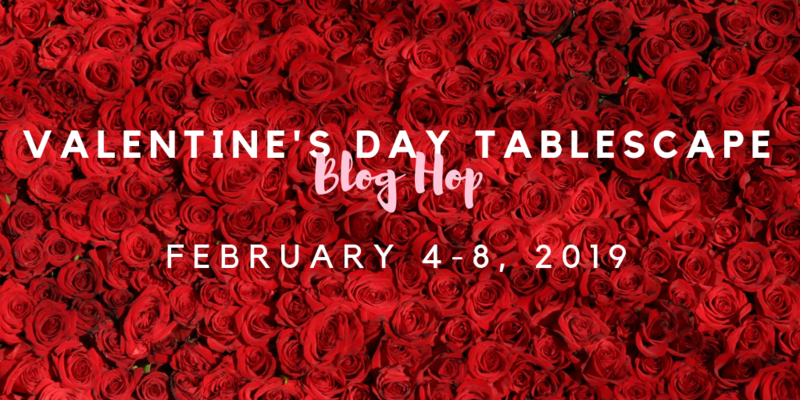 Now it is time to see how all of these other bloggers have styled their tables for Valentine’s Day! Cute tabletop, Chloe! 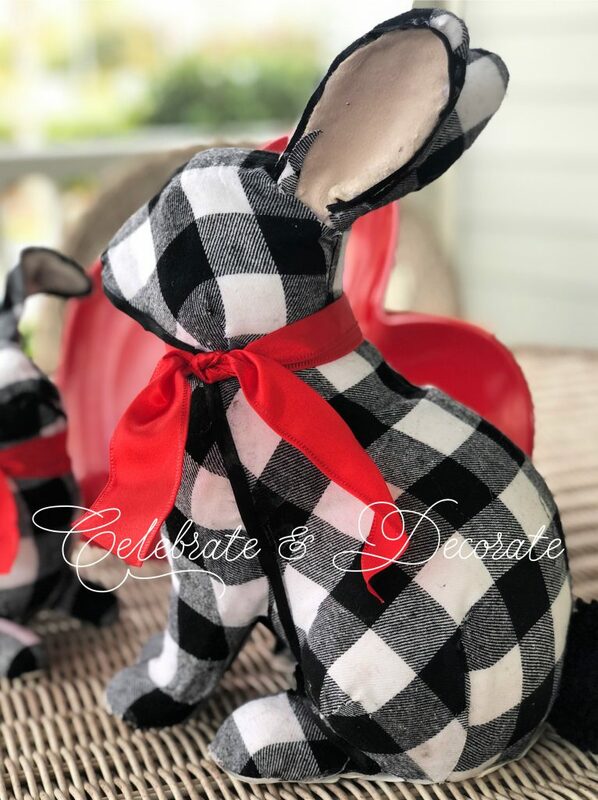 I love me some black & whites checks, and those bunnies are adorable on the table. I can imagine sitting on that porch and enjoying a little alfresco love in the dead of winter there in FL. It’s so nice that you can be there and also enjoy winter in OH when you miss it. Chloe, thanks so much for heading up this hop. I always look so forward to the variety of inspiration delivered! Chloe, black and white checks are perfect with the pops of red for Valentine’s Day. The bunnies are so cute and will work beautifully in all seasons. How nice to be able to set a table on your porch during February! Chloe, thank you for organizing the hops, it is always my pleasure to participate. Happy Valentine’s Day! 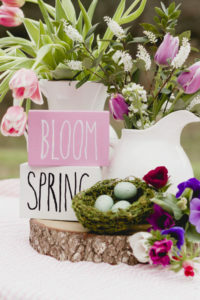 How fun, those checked bunnies are just so cute and provided such inspiration for a playful table. You’ve pulled together a wonderful table! Thank you for hosting the hop! How cute is this! Love the striking bold colors of the black and white buffalo check with the red hearts! The bunnies are adorable. I just saw those at the store the other day. I definitely like the ribbon added to them! I’d love to sit outside but at this point winter has a firm grip so I’ll have to wait. Thanks for hosting the blog-hop!! Chloe, you captured my heart with the black and white Buffalo checked table. Who can resist such liveliness? The boldness and the country feeling one gets from the pattern really brings about a festive and happy feeling. (Not to mention you have your table set up outside.) Gorgeous. The checked Bunnies are such a whimsical touch. 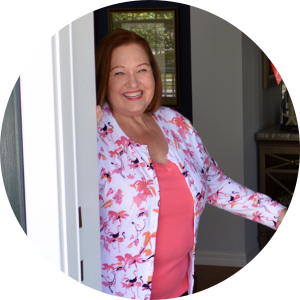 Love and playfulness is in the air at your house for Valentine’s Day. Have a wonderful time. Love your Valentine Tablescape! I’m seeing coupes everywhere. It is true things cycle around in style. I have my mother’s and mother-in-law’s coupes from the ’40s. Restaurants are serving cocktails of all kinds in coupes. Very creative table, Chloe. I love the heart plates and your color scheme. The black/white/red is such a classic combo and it works every time. Your red heart plates are real standouts and I’m doing my best not to buy some. 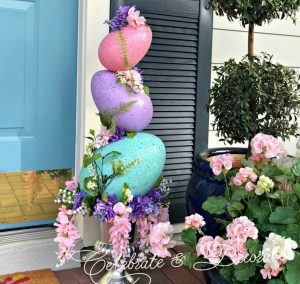 Those bunnies are indispensable and with a quick change of ribbon, you can use them for so many occasions. Thanks for another successful blog hop and safe travels! Chloe, oh, my, goodness — how incredibly cute are those bunnies?! And, how clever and simple to turn Easter bunnies into a sweet Valentine’s couple. 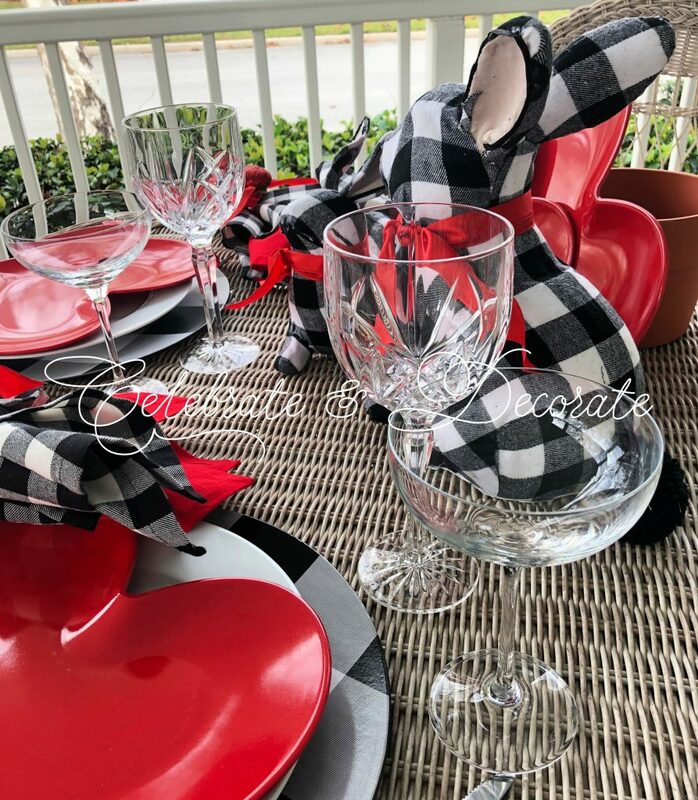 I think you know how much I use black in white in my tablescapes and decor, so I’m crazy about the buffalo check with red colors. Utterly charming table. Chloe, I am loving the black and white buffalo check with the pops of red. Such a great color combo. The bunnies are darling. The red heart plates are so perfect. Champagne is a favorite of ours. Thank you so much for including me in these fun blog hops. I appreciate you taking the time to organize them. Oh Chloe, those bunnies are fabulous! I love the red heart plates too! This is a great table, especially for you and your husband, I know he’ll appreciate not having too much pink fluff 🙂 I am a sucker for buffalo checks, and this table just says “let’s have fun!” Very fabulous and thank you for taking such good care of us!!! Thank you so much Jenna! I am sure those bunnies will be making an appearance again sometime soon! Now that is a fun table!!! Love the cheerfulness it exudes!! Jealous that you can set a Valentine’s table outside!!! Thanks so much for setting up another wonderful hop!! Have a fabulous Valentines Day!!! I love the black and white bunnies with the red! They look awesome! Oh those bunnies are too cute! They worked in perfectly with the buffalo check theme! They’ll have a multifunction with Spring & Easter coming. It’s always nice being able to use something for more than one holiday or season. Thank you again for the invitation and always pleasure joining your hops! Thank you so much Desiree, and thank you for joining in again! 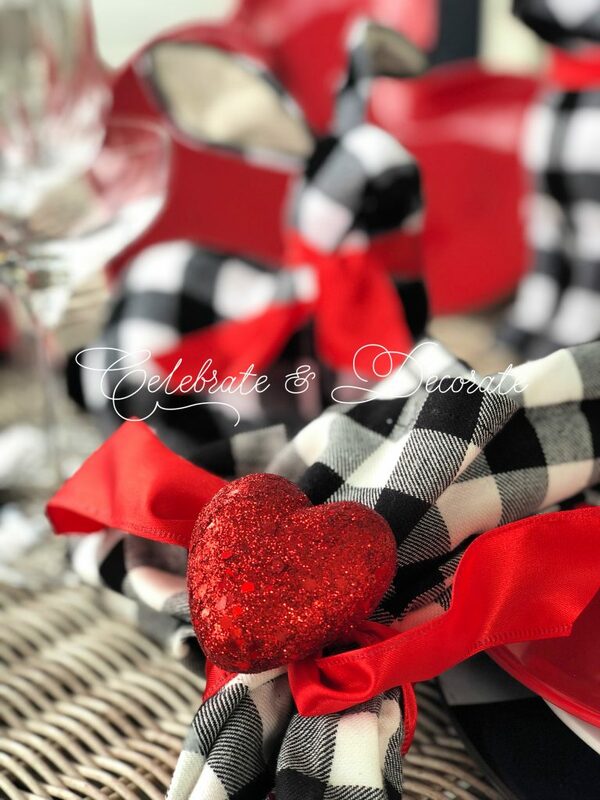 The black and white buffalo check with the pops of red is perfect for Valentine’s Day! 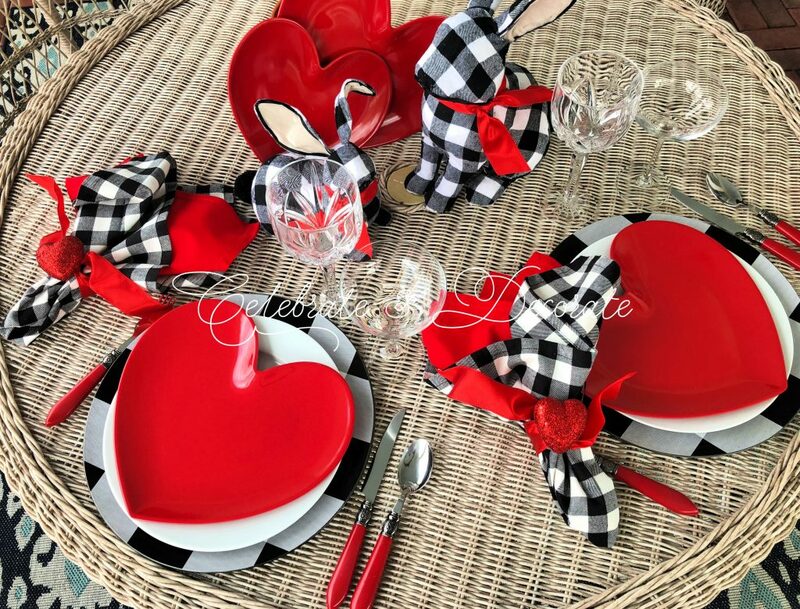 The pair of bunnies with the red ribbon makes for such an adorable inspiration for this table. Thank you so much for including me. I am so happy to join you on this blog hop. Happy Valentine’s Day!! 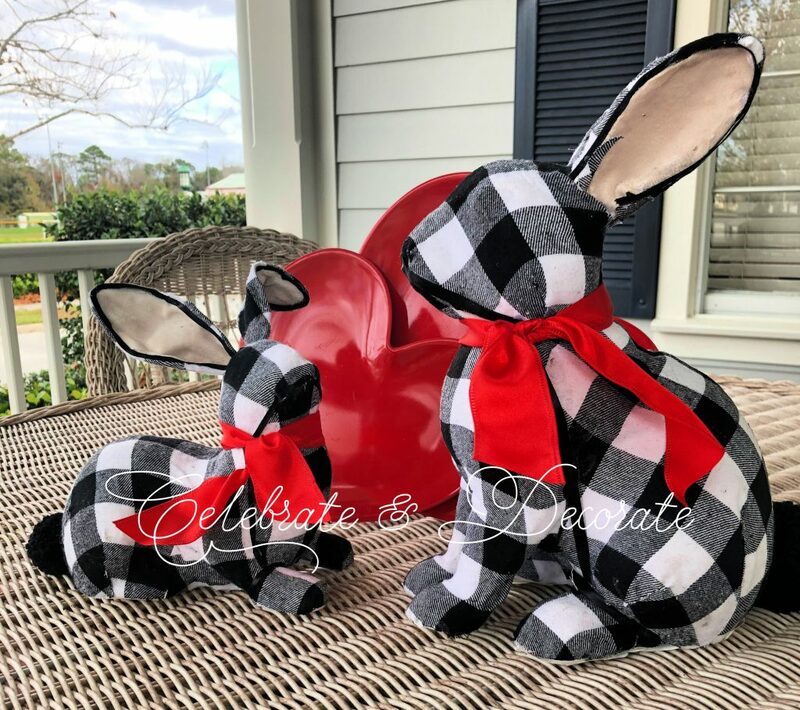 Absolutely love these adorable bunnies and the buffalo check in combination with the red! I’ve been visiting the other blog-hop participants little by little and it’s so much fun – thank you for hosting! Chloe, I love the contrast between buffalo check and romantic heart shaped plates! Bunnies couple is lovely, and add the perfect touch to the table. It’s always beautiful to join your blog hops, you’re incredibly talented! Thank you for this beautiful week! Chloe, thank you so much for hosting the blog hop again. You are a sweetheart. Love your check theme. Those buffalo check bunnies are adorable. The heart shape plates are wonderful too. I love the happy, festive feel. Great job. Chloe, you had me at buffalo check! The red, black and white color scheme atop the tan wicker is casual elegance. Oh, how I’d love to set an outdoor table right about now! 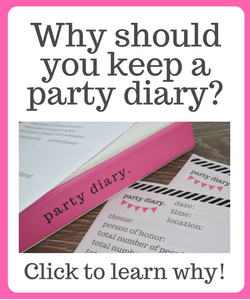 Did you find the glitter hearts you glued to the napkin ribbons at Dollar Tree? I almost bought some myself. I love your red handled flatware…it’s all in the details. Thank you for everything you do to make these hops so much fun and special. Have a wonderful Valentine’s Day! Chloe, what a fabulous find those bunnies were! So versatile! I too, love your red-handled flatware and love the contrast of the red against the buffalo check – don’t even get me started on all of your buffalo check wonderfulness. A lovely setting for Valentine’s Day! With all you have going on I do hope you can sneak a minute in to celebrate it. Thanks for another wonderful hop! Chloe this is just adorable! 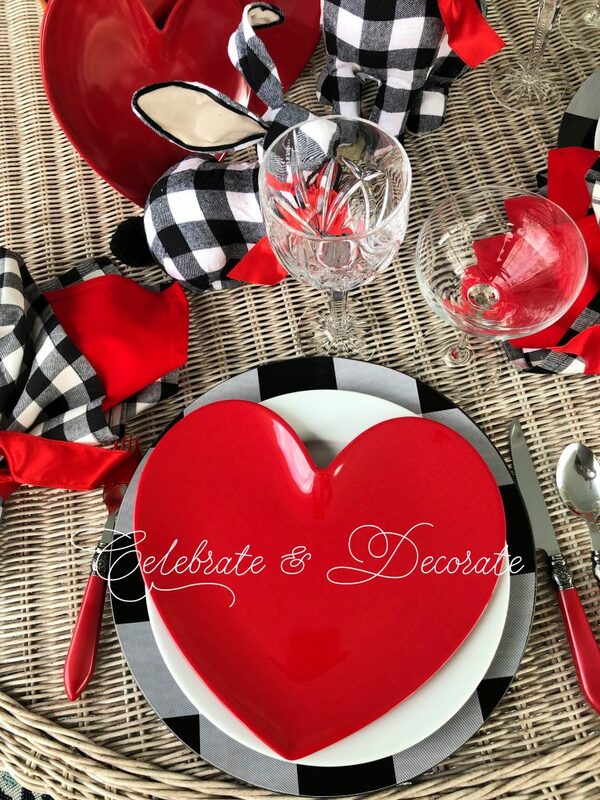 All that buffalo check looks perfect with the heart plates and your other Valentine touches. This is just so cute! How nice to set up an outdoor table too! Thank you so much for having me on this fun hop! Have a Happy Valentine’s Day! Chloe, I love this table setting! That buffalo check is so pretty against all of the red! Love and hugs! Gorgeous heart plates and bunnies!!! Oh Chloe, those bunnies are absolutely adorable with the precious red bows! I love the buffalo checks mixed with the rich reds. It looks so pretty and festive for a Valentine’s Day table. Everything looks beautiful! Thanks for hosting this fun hop! I always love being a part of this group, and I am always amazed by all of the talent. Happy Valentine’s Day!!! Thank you Shannon! I love these hops too! It is so much fun to see the different ways that everyone interprets the same basic idea or theme.